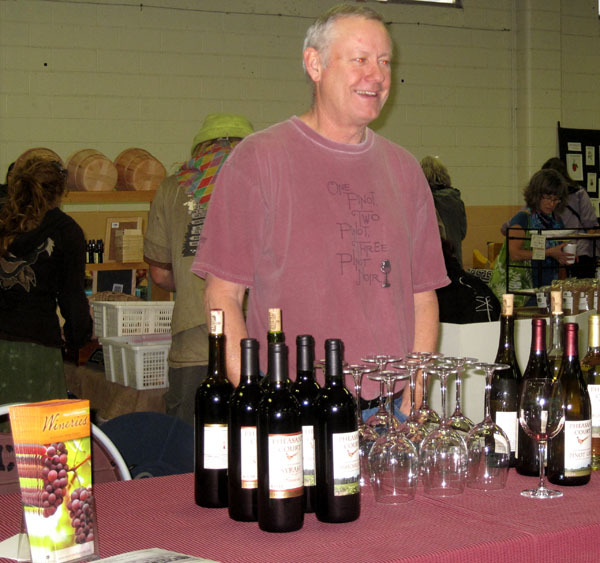 One of over 30 vendors at the 2012 Terra Madre Day event, Charlie Gilson of Pheasant Court Winery (Philomath, Oregon) offers tastings of two of the more unusual Willamette Valley wines, Roussane and Marechal Foch. Over 400 people braved the dreary, rainy skies to take in the 2012 holiday food fair hosted by Slow Food Corvallis and Ten Rivers Food Web at the Benton County Fairgrounds Auditorium. In our third year, we celebrated products of the local harvest from around the Willamette Valley with music to liven the atmosphere. There was something for everyone –holiday gifts of preserves, soaps, and salts; winter produce, cheese and meats, baked goods, sweets, and hand-crafted libations. And lots good cheer and information! Slow Food’s dinner of Three Sisters Chili , Kale Salad and corn bread was a huge success, selling out by 6pm. All proceeds from sales — a generous $800 — will be donated to the Starker Arts Garden for Education project. A big “Thank You” to all who offered their support for this important local project by enjoying a great seasonal meal! Our special thanks goes to the vendors, musicians, hula dancers, and volunteers who made this the special event that it was. Also, our heartfelt appreciation goes to the local producers who so generously supported Slow Food with donations of produce, meat, and kitchen facilities for preparing the chili-kale meal: NW Natural Beef (beef), Freddy Guys Hazelnuts (hazelnuts), Carol Deppe (squash), Denison Farms (garlic, kale), and Gathering Together Farm (tomatoes, onions, parsley, kitchen and equipment use).